DD Form 2888 or the "Critical Acquisition Position Service Agreement" is a form issued by the U.S. Department of Defense. Download a PDF version of the DD Form 2888 down below or find it on the U.S. Department of Defense Forms website. Fiscal Year 1991 dated November 5, 1990, Title 10 U.S.C. Chapter 87, as amended. Executive Order 9397, as amended. 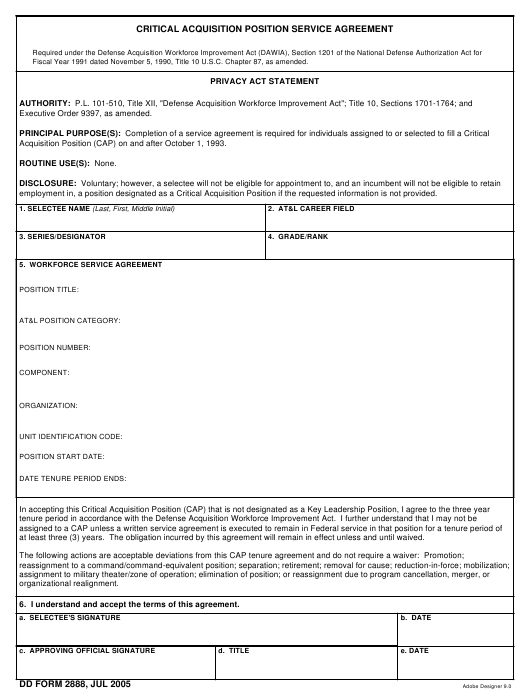 Acquisition Position (CAP) on and after October 1, 1993.
employment in, a position designated as a Critical Acquisition Position if the requested information is not provided. at least three (3) years. The obligation incurred by this agreement will remain in effect unless and until waived. 6. I understand and accept the terms of this agreement.